Is this shape-shifting keyboard a Shift in the right direction? The Zboard, the Shift's precursor, was massively flawed. Unfortunately though, SteelSeries seems to believe the Zboard's problems all stem from the execution of the design, not the actual layout itself, and have released the Shift. Some of the key problems have been addressed. Before, the action of the keys felt like each letter was laid out on the back of a bloated corpse. That's been changed a little now, with shorter travel distance on the keys to give it a more responsive feel. Unfortunately, though, there is still something of the dead about the action. Trying to use the Shift as a standard keyboard is a definite no-no. Some keyboards, even the specific gaming keyboards, can be a joy to type on, with firm, reassuring actions, but there's something rather spongy about the Shift. SteelSeries has also added hotspots to the board layout. This means it takes more pressure to operate certain keys than others. The WSAD keys, for example, take 60g of force to get a reaction while Shift and the space bar take 70g. That 10g difference is very noticeable, particularly if you're typing. Trying to get a capital letter or question mark in a sentence might well require you to change the way you type. 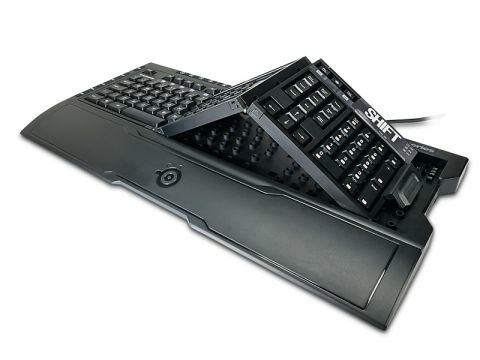 True, this is an MMO-specific keyboard, designed for MMO gamers to be able to purchase different board layouts for their game, or change every single key on the board to do something different. But then what I said about the Zboard remains true here. The keyboard has remained the interface of choice on the PC, mainly because of its versatility. You can play the latest shooters, then in a trice switch to your messenger client and chat to a friend, then put the finishing touches to the screen play that's bound to get picked up and make you millions in Hollywood. All without changing input devices.